Whether you’re travelling with a couple or with your children, there are lots of historic restaurants in Madrid waiting for you. In this article we will tell you some of the oldest and most traditional, leaving the modern cuisine for another time. Grab a pen and paper to write down these famous places in Madrid to eat the delicacies of the Spanish cuisine. The area around Plaza Mayor is full of restaurants, most of them very castizo (traditional). It’s obvious, thanks to the wooden doors, from the drawings in the facade and the letters painted in their windows, its traditional atmosphere. 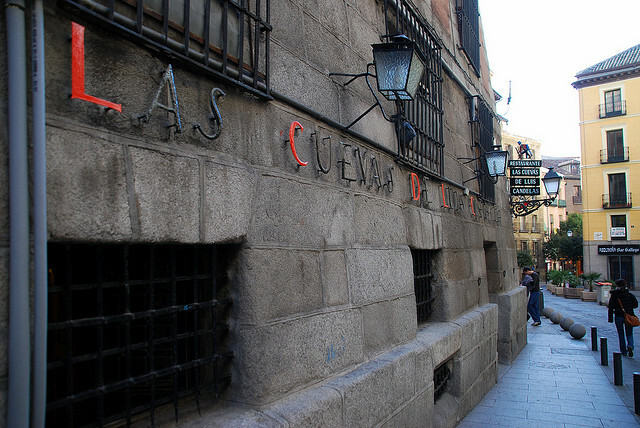 In fact, the oldest restaurant of the world, according to the Guinness Book of Records, is located right here, in Calle Cuchilleros, Sobrinos de Botin. It was founded in 1725 and it had an illustrious dishwasher, a young Francisco de Goya who arrived to the city to learn how to paint. This fact was mentioned by Ernest Hemingway several times in his book The Sun Also Rises. The specialty of the house is Cochinillo Asado (roasted suckling pig). Another historic restaurant in this area is Las Cuevas de Luis Candelas, right beside the Cuchilleros Arch. Legends says that the thief Luis Candelas, a kind of Spanish Robin Hood in 19th century, used to hide in those galleries to escape from the police. Last century, a businessman bought the localel and changed it into a very traditional place. Their specialities are Iberico ham, Cocido Madrileño, and hake. The most popular street for restaurants in Madrid is Cava Baja, which is also close to Plaza Mayor. The places here are a little bit more expensive and a little less touristy, so it’s worth visiting if you really want to try the best cuisine of the city. The most historic places are the so-calle ‘Posadas’, which used to be road hotels in previous centuries for muleteers who arrived to the city. Today, they have been reformed and offer exquisite food for tourists. The Posada de la Villa and the Posada del Leon de Oro stand out for offering good wines and special menus for groups. Casa Lucio is also one of the most famous restaurants in Madrid. Ministers, artists and businessmen usually come here to enjoy its speciality of the house, the Huevos Estrellados (broken eggs with fried potatoes). Beyond that, many other restaurants offer original suggestions, such as local steaks, broths and traditional dishes. We cannot forget other famous places in Madrid to eat. They are not really restaurants, but offer you a unique experience to enjoy. First of all, the gourmet markets of Madrid have been reformed to host high quality shops and tapas bars. San Miguel Market is the best example and is close to Plaza Mayo. It is where you can taste Acorn Iberico ham, shellfish from Galicia, local cheese and the best wines of the region. It is always full of people and doesn’t have many tables and chairs, so it is a good place to have something quick to eat. The building is also worth appreciating as it is one of the few examples of iron architecture in Madrid. San Anton Market, located in Chueca borough, is the other gourmet market in central Madrid. Their shops offer a mix between traditional products and modern suggestions, and it is a place where culture and art are really present. It has a gallery where exhibitions related to gastronomy are usually displayed. As you see, there are many historic restaurants waiting for you, with menus of all prices. They range from 15 euro per person to more than 50 euro. If you are having a walk around these areas and you want to find out if that locael is traditional, pay attention to these features that often characterize castizo restaurants in Madrid: wooden facade, names that begins with ‘Casa’ and menus in which there are no lack of Cocido, vegetables, steaks and suckling pigs. What time is it in Madrid? What is the weather like in Madrid?